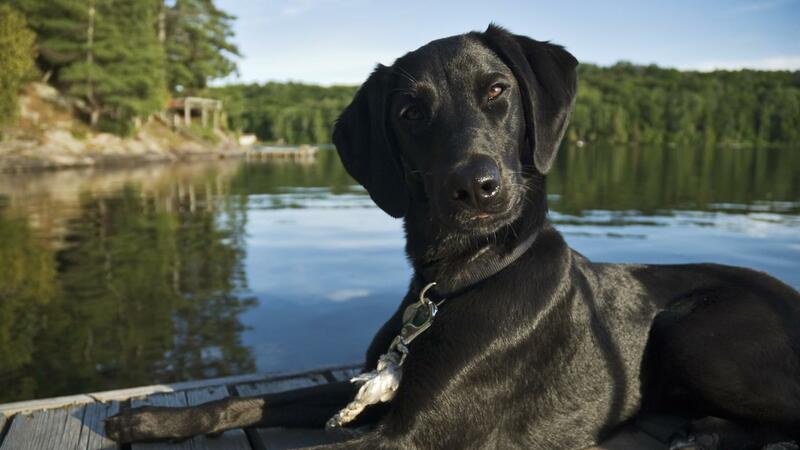 All Labrador Retrievers, including the black variety, originated in Newfoundland, Canada, an island in the province of Newfoundland and Labrador. The breed was originally nicknamed the "St. John's dog" in tribute to Newfoundland's capital city, and in the 1700s, fishermen trained the dogs to collect full nets and capture any fish that escaped. Historians believe Labradors were cross-bred with other dogs, such as spaniels, setters and the Newfoundland. Historically, black Labradors were the most commonly bred color variety, but yellow and chocolate Labradors eventually surpassed them in popularity. The entire breed faced extinction in the 1880s when Newfoundland laws placed high taxes on female dogs and restricted families to owning only one canine. The population was restored by breeders in England, and by 1991, the American Kennel Club recognized Labradors as the most popular dogs in the United States. Labradors have a long history as friendly, hardworking and athletic dogs, serving as hunters, rescue canines and loyal companions to owners with special needs. On average, Labradors range from 1.9 to 2 feet tall at shoulder height and weigh between 55 and 80 pounds. These dogs are admired for their smooth, short coats, which are soft, shiny, easy to maintain and resilient in wet or cold weather. Where Do Labradors Originate From? How Do You Groom a Black Lab Dog? What Are Some Newfoundland Ferry Routes? How Do You Look up Clarenville, Newfoundland, Court Dockets?